You know these people. You’ve watched them on Oprah, seen their faces on the covers of their best-selling books, and perhaps even been lucky enough to attend one of their sold-out seminars or lectures. 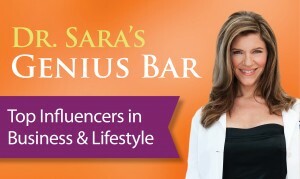 I’m talking about my favorite business and lifestyle influencers – who have created empires with their unique ideas and entrepreneurial know-how. Known for his best-selling book, “The 4-Hour Workweek,” Tim Ferriss is one of the masters of biohacking – a technique I talk about a lot that involves investigating how small tweaks in your lifestyle and routine can lead to greater productivity, better health and less stress. Prepare to have your mind blown listening to him talk about how putting in less work can actually yield you better results (à la the 80/20 rule). Sound good? Visit his website here: http://fourhourworkweek.com/blog/. While you’re there, check out his brand new podcast. So there you have it – five power players who will most certainly teach you a thing or two about life, business, living your dreams and finding lasting success. And since I know I’ve only scratched the surface with this list, I’m asking: Who are your favorite business and lifestyle influencers? Let me know on Facebook.